As March 8th is commemorated as the International women's day, we at Buds of Christ Charitable Trust take this opportunity to thank all the donors who through their generous donations have built confidence and hope for the widow women in ensuring their daughters are educated and empowered. Buds of Christ would like to present a case study to show how your support has impacted in the lives of women in ensuring their daughters are educated. Sangeetha is an orphan herself brought up by her aunt. She had studied till 8th standard and when she was 13 years old, her aunt got her married to a man aged 30 years old. He was a truck driver, but very loving towards her. 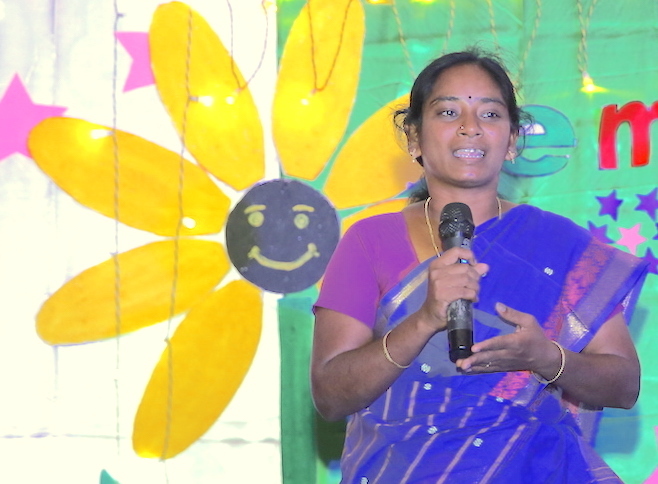 She had her first child, when Sangeetha was just 14 years old and second child, when she was 17 years old and when she was 20 years old her husband passed away due to a chronic health condition. Being young and with two little girl children, her in laws started treating her badly and accusing her as the cause of her husband's death. It was during that time, she felt the need to move out separately as the in-laws were even threatening to kill her and her two daughters. She started looking out for small jobs and with the income she managed the family. When her first daughter attained puberty, there were many marriage proposals brought to her to have her married, it was at that time, she was reached through Buds of Christ and supported with the educational support for the two daughters. Now her first daughter is completing her first year graduation in English and her second daughter is doing her 10th class. She always mentions that if not for the health and educational support of herself and her daughters, the situations that had aroused in her life would have repeated in her daughters lives too. Thank you dear supporters for lighting the lives of widows and orphan children.